*CliniTest® Tablets are a registered trademark of Siemens Healthcare Diagnostics Inc.
2. AAMI Standards and Recommended Practices, Dialysis, 2008 Edition, RD47:2008 Reprocessing of dialyzers. Association for the Advancement of Medical Instrumentation. Arlington, Virginia. 3. Proper Mechanisms for Assuring Disinfectant Concentrations for Use in Hemodialysis, Nephrology News & Issues, June 1999, pg 18-27. 5. Proper mechanisms for assuring disinfectant concentrations for use in hemodialysis. Nephrol News Issues. 1999 Jun;13(6):18, 23, 27. Arduino MJ. Use Serim Residual Formaldehyde Test Strips to test rinse solution from any convenient port after the solution has passed through the dialyzer. Test a sample of rinse solution from the drain or from the post-dialyzer recirculating line of the hemodialysis delivery system. Follow the RO manufacturer's instructions for collecting and testing samples from RO machines and water systems after disinfecting with formaldehyde. For reused dialyzers, it is important to test each dialyzer immediately before use to ensure that the disinfectant was adequately rinsed.4 Whenever the dialysis delivery machine, RO machine or water system is disinfected with formaldehyde, use Serim Residual Formaldehyde Test Strips to ensure complete rinse-out of the disinfectant. 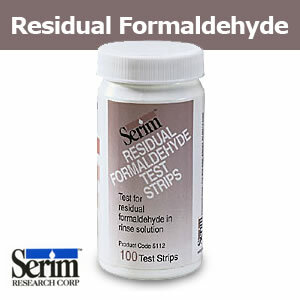 Serim Residual Formaldehyde Test Strips are supplied in ready-to-use form. When placed in contact with the sample according to the directions for use (see below), the indicator pad changes color relative to the concentration of formaldehyde present in the rinse solution. Sample Dispense 1 rounded drop of rinse solution onto the indicator pad using a syringe or by breaking the recirculating saline line. Collect 1 rounded drop of rinse solution on the indicator pad by passing the strip quickly (1 second) through the rinse stream. Test Strip Technique Allow the sample to remain on the indicator pad for 2 minutes, and then blot the side edge of the pad on a paper towel. Semi-quantitative Results Compare the color of the indicator pad to the color blocks on the bottle label. Serim Residual Formaldehyde Test Strips must be refrigerated until needed. Allow the bottle of strips to come to room temperature prior to opening or use.